It is also important to note that the RDBKMKR1 uses socket headers (receptacles) with an improved contact design compared to many typical economical socket headers that use a tuning fork contact design. While tuning fork contacts are well-suited for interfacing with a square pin (25 mils x 25 mils cross section), a tuning fork contact is not designed to interface with thin pins such as those used on an Arduino MKR (25 mils x 10 mils cross section). 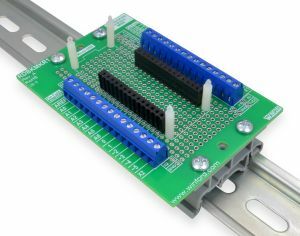 The socket headers used on the RDBKMKR1 provide a reliable connection even for the Arduino MKR thin pins. 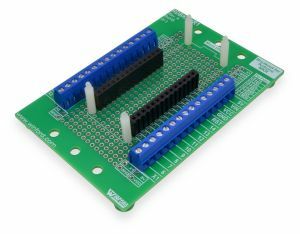 After plugging an Arduino MKR into the socket headers, signals may be conveniently accessed at terminal blocks and/or thru-hole pads. A number of convenient design features, such as a prototype area and pads that accommodate a DC-DC* converter for operation from higher supply voltages, facilitate the inclusion of an Arduino MKR in a variety of projects. *See app note section for more information. DC-DC converter is not included with RDBKMKR1. Approximate dimensions: 3.7" x 2.5"